The 1-2-3 pattern is one of the traditional patterns popularised by Victor Sperandeo and Joe Rosse. Even if you already have your trading strategy or, are more or less a non-technical trader I recommend you learn this pattern at least passively. The pattern falls among the strong formations that can generate profit or be used as a filter protecting you from opening loss-making trades. The 1-2-3 pattern is a well-known strong formation that can be used for forex trading as well as for cryptocurrencies or shares. The 1-2-3 pattern confirms trend reversal, thus it is a trend-reversing strategy. Be careful, if there is no trend in the market and the occurrence of a sideways drift the pattern may generate false signals. You should be able to cope with it because you know from one of our previous articles on how to recognize a trend (…trend lines and moving averages may help you). The patterns come handy when a trend, upward or downward, is long and you expect a reversal. 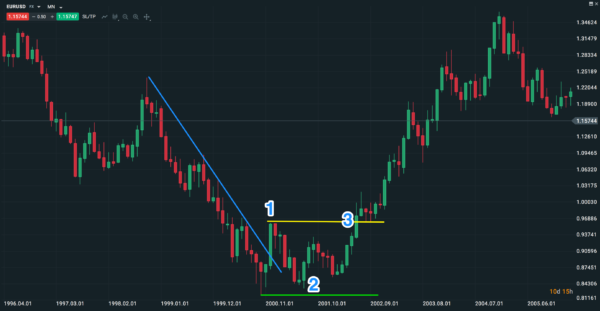 In such situations, the 1-2-3 pattern strategy has a great potential to generate a long-term profit, not only in forex markets. The 1-2-3 pattern represents a trend-following strategy, so what you should do first is identify the trend. I will show you a picture with a downward trend, the formation is called 1-2-3 down (and vice versa, an upward trend it’s called 1-2-3 up). The first thing to do is to identify the trend (blue line). Next, the trend gets broken followed by a retracement which in our case sets the high (see yellow line, local high, point 1). After the market strives to get back into a downward trend (point 2) it fails. It looks as if the trend line turned from the resistance line into a support line. The green low from the previous trend doesn’t get broken, the market returns to the yellow line. The break indicates a new trend and entry in position, point 3. In the case of the 1-2-3 pattern the logic is absolutely the same but as a mirror image. After breaking the local high (yellow line, point 3) the best you can do when planning the opening of a position is to wait for a throwback, or retracement after breaking the resistance line. This will enable you to filter all false signals. The 1-2-3 pattern also comes with different modifications, but the shape displayed above is the most typical one. If you decide to use this pattern I recommend you make a drawing like the one above. Later on, you will not need to draw the trend line. The 1-2-3 formation is popular among traders and frequently used across the instrument portfolio including forex, commodities, shares and options. As far as geographical zones are concerned, preferred trading is in long timeframes (30 minutes and above) as you want to enter a new long-term trend. When opening a position under the 1-2-3 pattern (potentially with a new trend), the first position shows a clear take profit and stop loss, the second one floating stop loss. Floating stop loss means that the stop-loss limit is automatically adjusted based on the top profit. For instance, if your stop loss is set at 100 points and your trade generates a profit of 100 points the stop loss will be set at break-even i.e. which means that at the worst you will gain zero profit (but suffer no loss). Obviously, you can manage the second position differently; floating stop loss is only one of the options. Using this trading strategy, it is worth considering the second position because if you hit a strong trend your profit potential is likely to be great. If you don’t intend to use the 1-2-3 pattern for trading remember at least that it exists to avoid opening a session against this formation. This formation appears on the chart surprisingly often during market reversals. The pattern can then help you as a filter for your current strategy.